AZFJ › Forums › Arizona FJ Discussion › Expeditions, trail runs, or gatherings › Asbestos Point New Years Day. 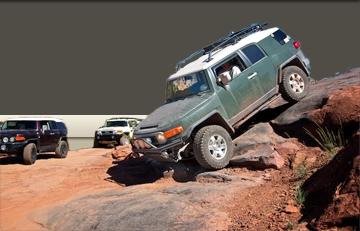 Forums › Arizona FJ Discussion › Expeditions, trail runs, or gatherings › Asbestos Point New Years Day. Asbestos Point New Years Day. Posted: Wed Jan 01, 2014 8:52 pm Post subject: Asbestos Point New Years Day. Expeditioneers led a small group to Asbestos Point today. The mines are located north of Roosevelt Lake at ~6800' elevation. The asbestos mines were operational from the early 1900's until ~1980. Don't worry...ZZMikey will do a judo chop dance (he learned it from Jeebus). Raymond, looking for that last bit of clearance. Ross, (Roof Top Tent Guy) trying to convince Don he is a worthy passenger. Four Peaks from the summit! Strange asbestos mine creatures...lurking in the shadows! Kids playing in the machinery. Who knew...Don and Ray had the same camo pants! Fun day with good friends! Link to the rest of the pictures. Posted: Wed Jan 01, 2014 9:02 pm Post subject: Re: Asbestos Point New Years Day. Looks cool! I was off of Young Highway and A+ cross road looking for pigs. Must of just missed you guys. I got home at 7. Posted: Wed Jan 01, 2014 9:17 pm Post subject: Re: Asbestos Point New Years Day. Looks like a fun day. I don't recall seeing anything announced for it, must have been by special invitation only. Posted: Wed Jan 01, 2014 9:21 pm Post subject: Re: Asbestos Point New Years Day. My chain saw has cleared several trails in the Anchas. I have never seen so many fallen trees anywhere else. Posted: Wed Jan 01, 2014 9:33 pm Post subject: Re: Asbestos Point New Years Day. Looks like a nice trail run. If I didn't have family visiting, and knew about this, I would have joined you guys. Call me on the secret hotline next time. Posted: Wed Jan 01, 2014 9:34 pm Post subject: Re: Asbestos Point New Years Day. Looks fun....did that guy take his tent off to get through? Posted: Wed Jan 01, 2014 9:44 pm Post subject: Re: Asbestos Point New Years Day. Sad I missed this. It looks like he got a ride Donkey. Said by me spotting on the last Obstacle going up the Back Way to Crown King. Posted: Wed Jan 01, 2014 9:45 pm Post subject: Re: Asbestos Point New Years Day. Posted: Wed Jan 01, 2014 10:03 pm Post subject: Re: Asbestos Point New Years Day. Looks like a good day ... but you guys don't return waves from FJs. At least not the invisible tan one pulling a leetle trailer that passed you west of Superior this afternoon. I figured that many FJs together had to be from AZFJ. Was there a 4dr Jeep with you guys? That trail is one more reason I need to buy a chainsaw. That makes 3 so far. Nobody bought me one for Christmas , so maybe this spring I'll treat myself to one. Posted: Wed Jan 01, 2014 10:23 pm Post subject: Re: Asbestos Point New Years Day. Posted: Wed Jan 01, 2014 10:24 pm Post subject: Re: Asbestos Point New Years Day. Posted: Wed Jan 01, 2014 10:31 pm Post subject: Re: Asbestos Point New Years Day. I guess the Jeep I saw was just trying to ruin the all FJ vibe you had going on the 60. Posted: Wed Jan 01, 2014 10:39 pm Post subject: Re: Asbestos Point New Years Day. We tried pretty hard to keep it together...sometimes, THEY get in the way. Posted: Wed Jan 01, 2014 11:32 pm Post subject: Re: Asbestos Point New Years Day. Did this solo back in June and never had I seen so many fallen trees. It's a really interesting little trip. Posted: Wed Jan 01, 2014 11:35 pm Post subject: Re: Asbestos Point New Years Day.